African music; Composition; Piano Performance. He is also the pioneer of various theories, including those of African pianism and creative ethnomusicology. "African Drums in Symphony Hall: Village Signals in Intercontinental Encounters." In New Pastoral . Edited by John Kinsella and Susan Stewart, Tri Quarterly 116. Evanston, IL: Northwestern University Press, 2003. "Gods and Deputy Gods: Music in Yoruba Religious and Kingship Traditions." In The Interrelatedness of Music, Religion and Ritual in African Performance Practice . Edited by Daniel K. Avorgbedor. Ceredigion, Wales: The Edwin Mellen Press, 2003. "Intercultural Music in Africa and Latin America: A Comparative View of Fela Sowande and Carlos Chavez." In Musical Cultures of Latin America: Global Effects Past and Present. Edited by Steven Loza. Selected Reports in Ethnomusicology 9. Los Angeles: Ethnomusicology Publications, UCLA Department of Music, 2003. "Distance Learning and Oral Traditions of Music: A Case of Yoruba Drumming." Journal of the Indian Musicological Society 33, 2002. "Text Setting in African Composition." In The Landscape of African Music . Edited by Kofi Agawu. A special issue of Research in African Literatures 32/2, 2001. "Concepts of Neo-African Music as Manifested in the Yoruba Folk Opera." In The African Diaspora: A Musical Perspective. Edited by Ingrid Monson. New York: Garland Publishing, 2000. "African Traditional Musical Instruments in Neo-African Idioms and Contexts." In Turn Up the Volume! A Celebration of African Music . Edited by Jacqueline Cogdell DjeDje. Los Angeles: UCLA Fowler Museum of Cultural History, 1999. "Drumming for the Egungun: The Poet-Musician in Yoruba Masquerade Theater." In The Yoruba Artist: New Theoretical Perspectives on African Arts. Edited by Rowland Abiodun, Henry J. Drewal and John Pemberton. Washington, D.C.: Smithsonian Institution Press, 1994. Yoruba Drumming: The Dundun Tradition. Bayreuth: Bayreuth African Studies Series, 1990. Essays on Music in Africa 1. Bayreuth: Iwalewa Haus, 1988. Essays on Music in Africa 2: Intercultural Perspectives. Bayreuth: Bayreuth African Studies Series, 1989. Below Rusumo Falls, a setting of a poem by Olusola Oyeleye for soprano, kayagum (Korean zither), flute, piano, Yoruba dancer and Yoruba drums, 2003. Themes from Chaka 2, for piano, 2003. Orunmila's Voices: Songs from the Beginning of Time, for soloists, chanters, chorus, dancers, and symphony orchestra, 2002. Study in African Jazz No. 3, for piano, 2002. "Neo-African Church Music: Continuity and Change in African Traditional Music in the Twentieth Century," keynote address at a Symposium on African Music in the Church, Azusa Pacific University, California, 2004. "Halim El-Dabh and African Pianism," at the conference of the Society for American Music, 2004. "Modern Music and the African Aesthetic," at the 8th Biennial International Symposium and Festival of the Centre for Intercultural Music Arts, Institute of Education, University of London, 2004. "Post-Diasporic Homecomings: Myth or Possibility?" (with John Baldacchino), at the 2nd biennial international symposium and festival on the theme "Composition in Africa and the Diaspora," at Churchill College, University of Cambridge, 2003. "Orunmila's Voices: Yoruba Ritual Arts in Modern Composition - A Process of Secularization," at an International Symposium on the Music of Africa, Princeton University, 2003. "Theory, Scholarship, Myth and Mysticism: Sources of My Creativity," at the 7th Biennial International Symposium and Festival of the Centre for Intercultural Music Arts, Churchill College, University of Cambridge, 2002. "J.H. Kwabena Nketia and the African Avant-garde," at the 1st Biennial International Symposium and Festival on "Composition in Africa and the Diaspora," Churchill College, University of Cambridge, 2001. "Is Ethnomusicology Relevant in the Twentyfirst Century?" at the 6th biennial International Symposium and Festival of the Centre for Intercultural Music Arts, Institute of Education, University of London, 2000. 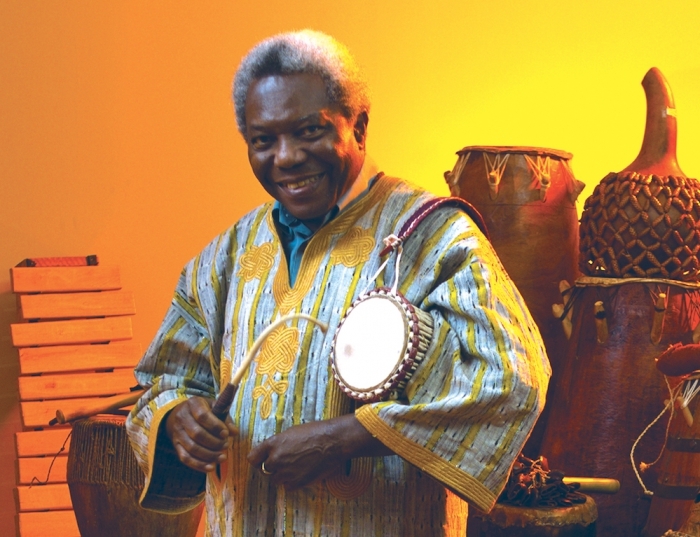 Chaka, an Opera in Two Chants, from a poem by Leopold Senghor, for soloists, Yoruba chanter, chorus, and orchestra of African and Western instruments, performed by the City of Birmingham Touring Opera, conducted by Simon Halsey. MRI-0001CD, 1999. Chaka, St Louis, MO, 2000, Cambridge, UK, 2000. "Ritual Dance" from Orunmila's Voices, Ghent and Brussels, Belgium, 2002, Toronto, 2003, Liverpool, 2003. Three movements from Orunmila's Voices and other compositions, Toronto, Ensemble Noir, spring 2003. Female arias from Orunmila's Voices, Toronto, Lagos, Nigeria, and various cities in South Africa, 2003. Orunmila's Voices, premiere, New Orleans, 2002. Orunmila's Voices, premiere, New Orleans, 2002. Chaka (opera) at international millennium colloquium on "The Power of the Word," Churchill College, Cambridge University, November 2000. Works by Nketia, Uzoigwe and Euba (with Dawn Padmore, soprano), Churchill College, University of Cambridge, 2004. "Towards an African Pianism: Akin Euba Performs His Keyboard Music," at Azusa Pacific University, 2004, and Institute of Education, University of London, 2004. Azusa Pacific University, School of Music's first World Music Scholar-in-Residence, 2004. Composer-in-Residence, Ensemble Noir, Toronto, 2003. Organizer, 1st and 2nd biennial international symposium and festival on the theme "Composition in Africa and the Diaspora," Churchill College, University of Cambridge, 2001 and 2003. Organizer, International symposium and festival on the theme "Towards an African Pianism: Keyboard Music of Africa and Its Diaspora," University of Pittsburgh, 1999. Overseas Fellow, Churchill College, University of Cambridge, 2000-1. Books-in-progress include (1) Bridging Musicology and Composition (2) Operatic Transformations of African Resources: A Theory of Composition and a Composition of Theory.